April monthly data reported this past week included significant declines in industrial production and capacity utilization, declines in several regional manufacturing indexes, and a big decline in both monthly consumer and producer prices. due mainly to declining gas prices. Retail sales were positive. Michigan consumer sentiment, mainly as to present conditions, reached a multiyear high, while future expectations remained in the basement. Due mainly to soaring building permits, the April LEI rose 0.6. Housing starts had a big decline. Rail transport had a second decent week, after turning negative for three recent weeks. The Harpex index continues to improve slowly from its January 1 low of 352, and the Baltic Dry Index remains above its recent low. Gallup's YoY comparisons have generally been extremely positive since last December, and were so again this week. The ICSC varied between +1.5% and +4.5% YoY in 2012, so this was an extremely poor week. By contrast, the JR report this week also rebounded the upper part of its typical YoY range for the last year. Initial claims spiked, but remained well within their recent range of between 325,000 to 375,000. The ASA is still running slighty below 2007, but now essentially unchanged from last year as well. In other words, the comparison has been generally deteriorating on a YoY basis. Housing prices bottomed at the end of November 2011 on Housing Tracker, and averaged an increase of +2.0% to +2.5% YoY during 2012. This weeks's YoY increase makes another new 6 year record. Loans turned up at the end of 2011 and averaged about 1% gains YoY through most of 2012. In the last several months the comparisons have softened significantly. This year purchase applications have finally established a slightly rising trend, and this week's number was the best in 3 years. Refinancing applications were very high for most of last year with record low mortgage rates, but decreased slightly since then. Interest rates for corporate bonds have generally been falling since being just above 6% two years ago in January 2011, hitting a low of 4.46% in November 2012. Treasuries have fallen from about 2% in late 2011 to a low of 1.47% in July 2012. Spreads have varied between a high over 3.4% in June 2011 to a low under 2.75% in October 2012. Real M1 made a YoY high of about 20% in January 2012 and has generally been easing off since. This week's YoY reading increased sharply. Real M2 also made a YoY high of about 10.5% in January 2012. Its subsequent low was 4.5% in August 2012. It has increased slightly in the last couple of months. The price of a gallon of gas, after declining sharply in March and April, has risen again in May. The 4 week average for gas usage remained negative after previously spending nine weeks in a row being positive YoY. The TED spread recently increased again, but is still near the low end of its 3 year range. LIBOR remained at its new 52 week low and is close to a 3 year low. After months of gradual deterioration, last week there were no negatives in the weekly indicators. This week was a great big "meh." Positives included house prices, and YoY purchase mortgage applications. Money supply was positive. Overnight bank rates are somnolent. Consumer spending as mesured by same store sales were mixed, with two strong positives and one very week reading. Rail traffic had a decently positive week in over a month. Negatives included commodities, real estate loans, mortgage applications, and the Baltic Dry Index, but these were all minor. The only real negative was the spike in initial jobless claims, which may or may not portend anything. All in all, Meh. Have a nice weekend. For reasons unknown, blogger and I are having a debate about uploading pictures. NDD will be here over the weekend and I'll be back on Monday. Last week I took an updated look at the long leading indicators identified by Prof. Geoffrey Moore, the founder of ECRI, 20 years ago. None of those 4 series, which in the past have generally topped out 12 months or more before the economy as a whole, showed any sign of rolling over. This morning the Conference Board's LEI also showed a continued positive trend, increasing 0.6 in April (thanks in large part to building permits, initial jobless claims, and the yield curve), and +1.7 over the last 6 months. If this list looks familiar, it is because most of its components made it into the 1990's remake of the LEI, which was subsequently turned over the the Conference Board for calculating and publishing, and over half of the components (or similar components) still are contained in the Conference Board's Index. 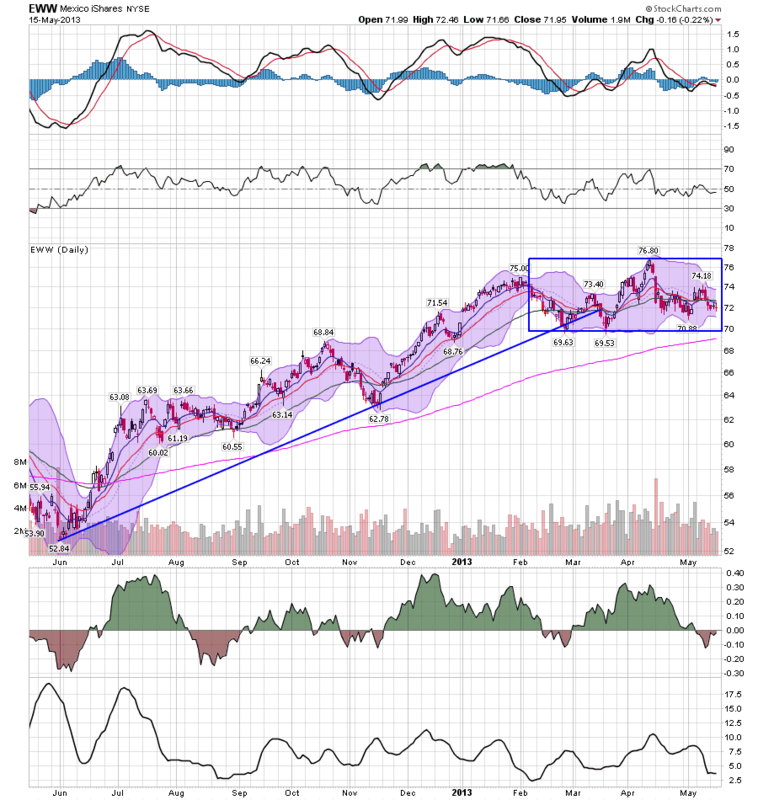 Where they differ is primarily that the Conference Board's LEI is a mix of longer (e.g., building permits) and shorter (e.g., initial jobless claims) indicators, whereas Moore advocated monitoring the Long Leading Index, and then looking for confirmation of a turn in the short leading index. No surprise here, this index has been making new highs. This series made new yearly lows in the last couple of months, and has only been lower one time since the end of the great recession. The minimum time between these establishing a new low and the onset of a recession has been 3 months, but is usually longer. This has been at a rate consistent with both expansions and recession, so is giving an ambiguous signal. These are consistent with continued growth. This is greatly influenced by the price of oil. This series has recently been increasing, not declining. These are holding up rather well. I am told that Dun and Bradstreet's tabulation of business starts and bankruptices still does exist, but is proprietary and only available in a specialist publication. It is the only indicator to which I don't have access. Like other manufacturing series, these are flagging, but are not decisively showing either recession or expansion. 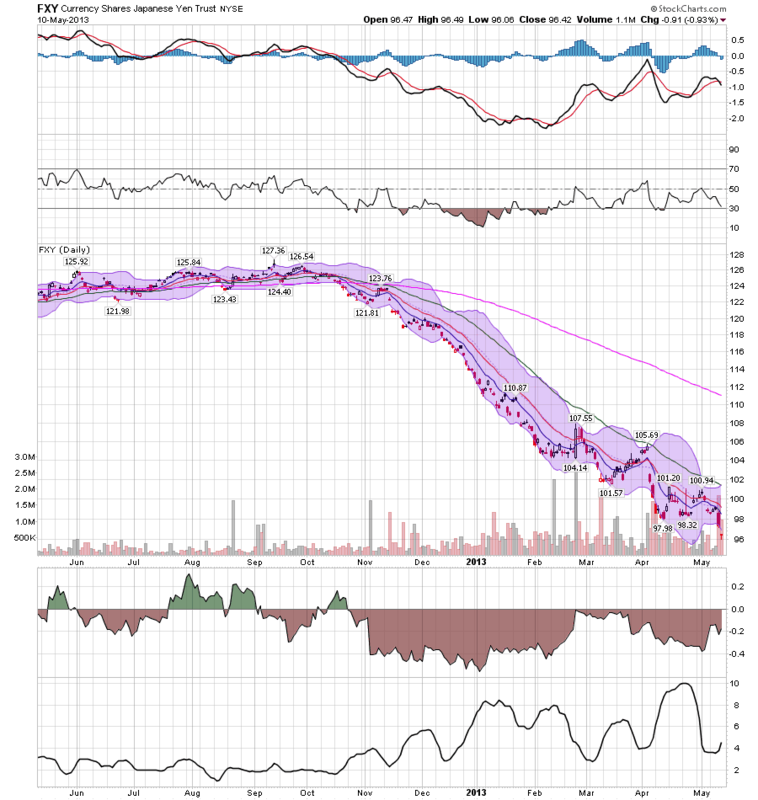 Generally speaking, there is a bifurcation in the short leading indicators. Those closely associated with manufacturing have either stalled or actually declined slightly over the last year, to the point where they are at least consistent with, if not exclusively associated with, the onset of recession. The other indicators are not consistent with recession, but continue to show an expanding economy. In summary, with the exception of manufacturing, which is clearly hurting, both the long and short leading indicators are telling us to expect that the economy will continue to grow for the next few months and even into next year. As I indicated last week, however, this can be derailed by sudden external events. The increase in the payroll tax, Sequestration, and the next fight over the debt ceiling coming up in a few months all qualify as such shocks. Why Aren't We Seeing Inflation? I've been on a bit of an inflation kick this week, largely because there just isn't any in the economic system as a whole right now. We are seeing isolated areas of it in some countries (India and Brazil), but that's it. Overall, prices are very much contained. Why? Let's look at a few underlying reasons. 1.) 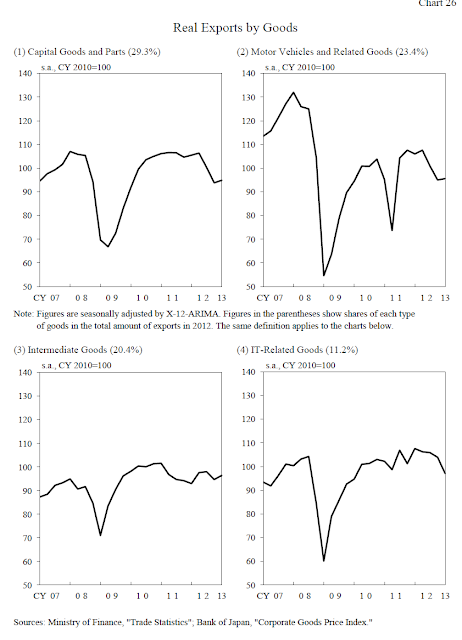 China's growth slowdown. I realize that saying China's growth is slowing down is a bit of a misnomer, as their GDP growth is moving from ~10% to ~7%. But for an economy that has been experiencing massive growth for a number of years (in the 10%+ range), this is a big move. The slower growth means the consumption of raw materials from China just won't be there at the same pace as before. Also remember that China wants to change its economic growth composition from one of exports to internal consumer demand, which also lowers growth for raw materials. 2.) The growth of the US oil market. I'll touch on this more next week, but the US' development of shale oil as a viable method of extracting oil is keeping a lid on energy prices. This is keeping one of the most volatile areas of costs very much contained. 3.) Slow growth. 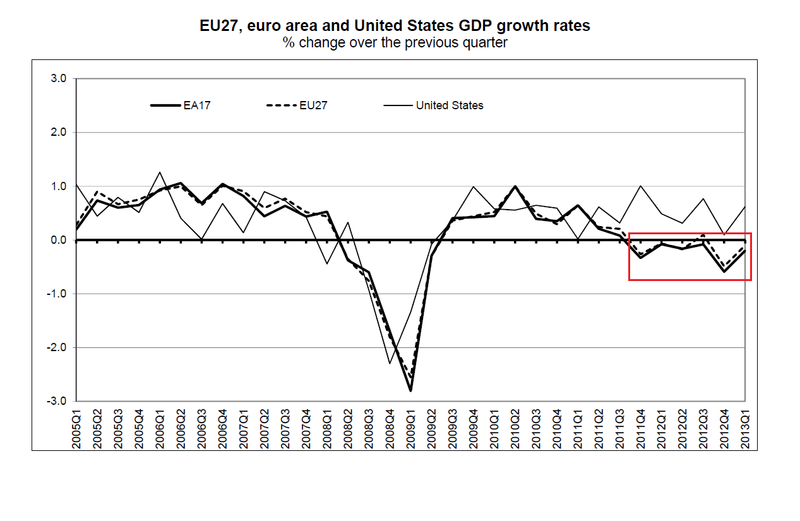 The EU's ongoing recession is really the big story here. The second largest economic region in the world (behind the US) is now in its sixth quarter of negative growth. That means lower demand, which means little upward price pressure. Also note that we're seeing slower growth in some larger Asian economies as well. 4.) 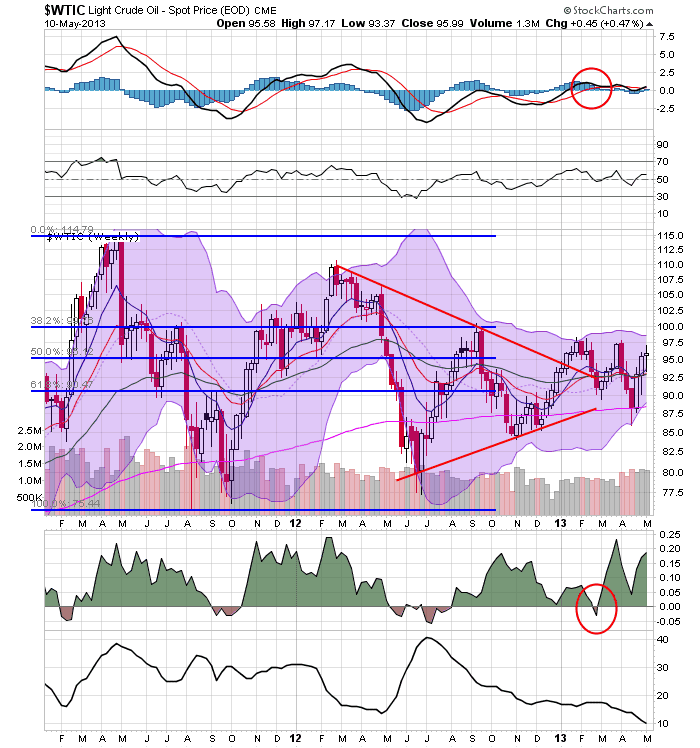 Is the commodity bull market over? Commodities were the big investment category for the last 12 years as traders bet primarily on Chinese growth driving commodity demand. Is that story over? Who knows at this point. But, the question is certainly in play. 5.) Debt Deflation Dynamics: The US has had a slow recovery because we're in the middle of a debt-deflation economy. However, we aren't the only economy to be experiencing this phenomena. Canada and South Korea also have consumer debt issues as do Spanish banks. There's just enough of this dynamic across the globe to make it a contributing factor to slow growth, which leads to depressed demand, which in turn lowers inflation. The South Korean Economy has been growing since the end of the recession. However, they are starting to run into problems of a few fronts. As an export driven economy, they're losing business from the overall slow growth of the world economy. China's change to a more demand driven economy are also contributing. Living next door to the world's craziest dictator does not help. And finally there are a few structural issues that are contributing. Overall, there are few signs that the economy will halt all growth, but there are several areas leading to slowing growth. 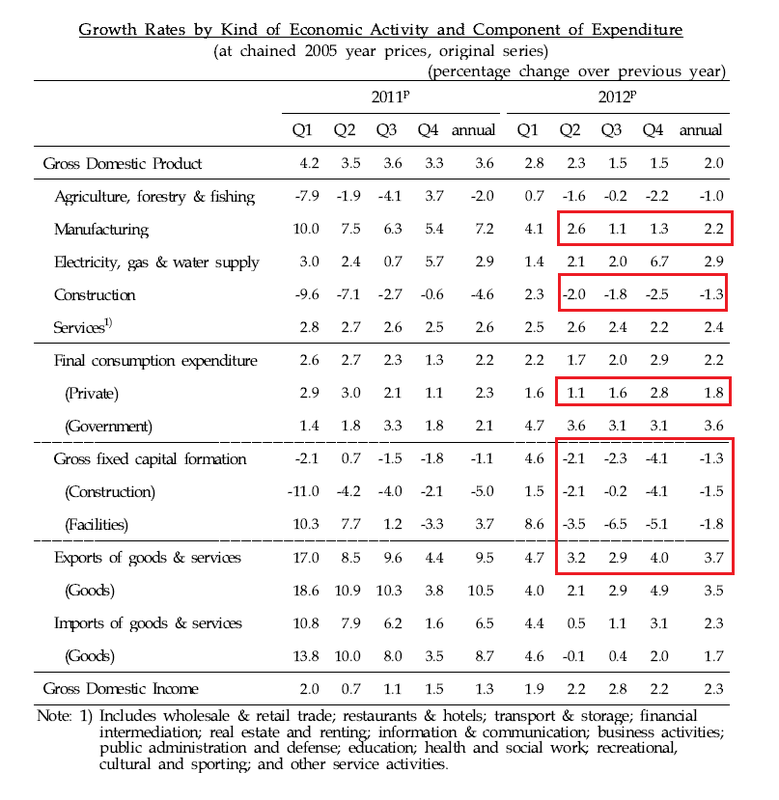 The above graph of year over hear growth in various GDP components shows that growth is occurring, but at a slower rate. Manufacturing has slowed to a roughly 1.75% average over the last four quarters; private consumption has slipped to a 1.8% average over four quarters while investment and construction have been contracting. And while exports are still positive, they are also slowing down. In Korea, exports have maintained their trend of recovery, albeit at a modest pace, but the Committee appraises economic growth to have remained weak, with indicators related to domestic demand alternating between improvement and worsening. On the employment front, the increase in the number of persons employed has accelerated, centering around the 50-and-above age group. Going forward there is no change to the Committee’s forecast that the domestic economy will show a negative output gap for a considerable time, due mostly to the slow recovery of the global economy, to the influence of Japanese yen weakening, and to the geopolitical risk in Korea. Like most economies, there is a projection for below trend growth caused in general by a slowing world economic situation. There is also the issue of Korean goods competing against Japanese goods in the world market. With Abenomics lowering the value of the yen, Korean goods are less competitive. In addition to lowering interest rates, the Korean government has unveiled a supplementary budget that provides a measure of stimulus. South Korean consumers are among the world’s most heavily indebted, with a household debt pile equivalent to about 160 per cent of annual incomes. The country’s financial authorities view this as one of South Korea’s main economic weaknesses, and as a major drag on consumer spending. In most places in the world, companies and households have been reducing their debt burden. But in South Korea, leverage still remains too high. The top 30 conglomerates have 1,000tn won ($893bn) in debt according to one recent study. In the second half of last year, four of the top 12 groups were unable to cover their interest payments from operating profit. 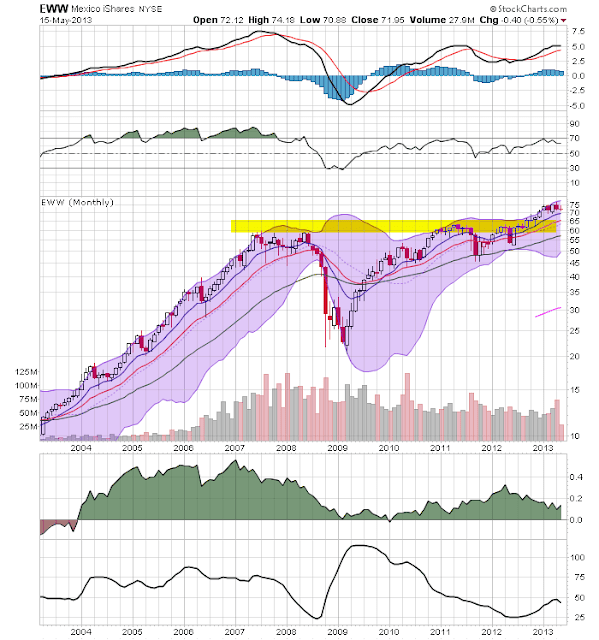 On the weekly chart, we see a consolidation triangle from mid-2011 to mid-2012. 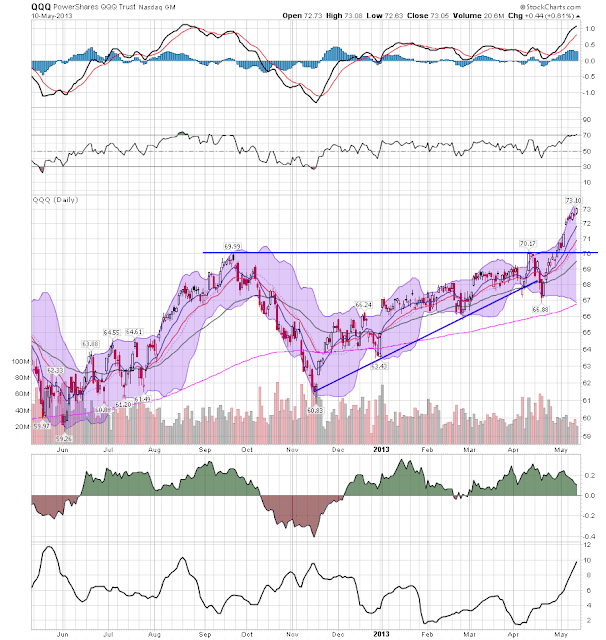 Prices broke through resistance in the spring of 2012 and rallied a bit, but have been falling since the beginning of the year. The fall was caused by the China slowdown and the drop in the yen, which competes with South Korea in the export market. Also remember SK's northern neighbor is doing its best to destabilize the region. 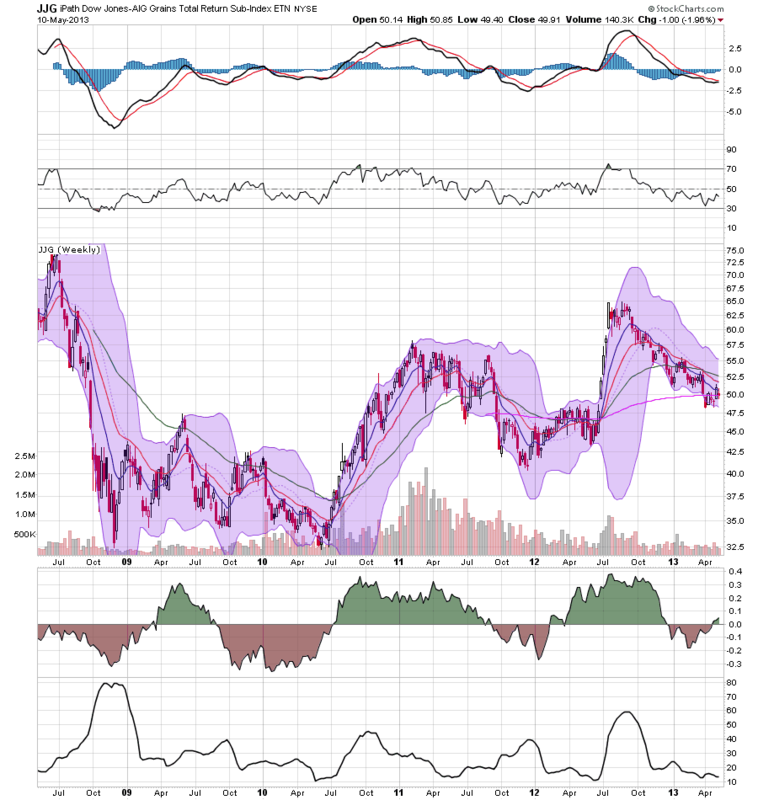 On the daily chart, notice that there is little to no direction in the market at all. We see the July-February rally, but also note the trend break in the Spring. The current EMA picture is muddled; all are entangled close to the 200 day EMA with no one giving any meaningful directional signals. 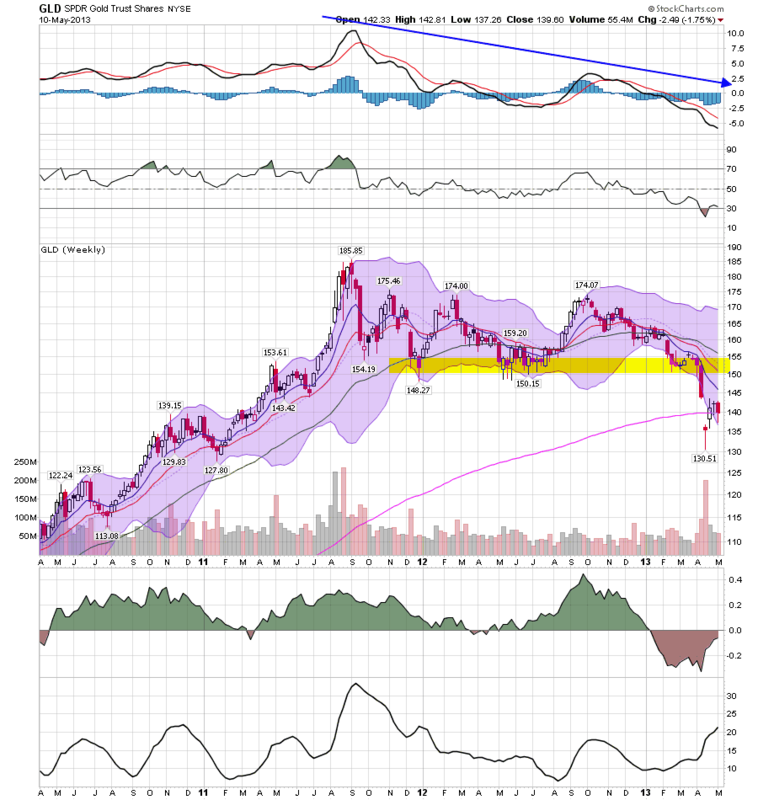 Momentum has been mostly weak. The CMF tells us there is some money flowing into the market. The SK ETF is directionless right now. Traders are most likely waiting for a clearer set of fundamental economic signals before firmly committing to the market. Sales at eating and drinking places in April reached $45.9 billion, a $200 million seasonally-adjusted increase from the previous high in December 2012, according to preliminary figures from the U.S. Census Bureau. "After totaling nearly $45.7 billion in December, eating and drinking place sales were dampened somewhat during the first three months of 2013, likely due in part to the impact of the payroll tax hike," the National Restaurant Association's Chief Economist Bruce Grindy wrote in his analysis of the numbers. Sales have steadily increased since dipping to $45.2 billion in February. Those numbers are expected to continue rising, according the restaurant group's own survey. Because the decline in April prices was due to energy costs, I do not think this correlates with economic weakness, but rather shows how even a temporary loosening of the oil choke collar acts like an economic stimulus. Mexico’s lower house of Congress late Thursday gave overwhelming general approval to a telecoms bill that seeks to curb the power of some of the country’s most powerful businessmen. The approval, by 414 votes to just 50 against, marks the first big step towards introducing more competition into telecoms and television as part of a wider push to make Latin America’s second-largest economy more competitive and grow faster. Mexico’s centrist government announced it would send a financial reform bill to Congress that seeks to boost economic growth by making it easier and cheaper for companies to access credit. Enrique Peña Nieto, the reform-minded president, has said that, together, the reforms would lift the annual growth rate in Mexico to as much as 6 per cent a year within five years from less than 4 per cent in 2012. Flanked by opposition leaders, now a customary sight when announcing an important reform, Mr Peña Nieto said the reform proposal was “essential for the economy to grow more and to generate the jobs that our population needs”. The upgrade of Mexico’s sovereign ratings reflects its strong macroeconomic fundamentals, including the absence of macro-financial imbalances, consistent adherence to its inflation targeting and flexible exchange rate regimes, as well as the greater than anticipated commitment of the new administration and Congress to pass structural reforms. Moreover, the resilience of the economy is supported by the stabilization of oil production and progress in addressing drug-related violence, albeit it remains high. The current account is in good shape. The government budget deficit is contained. 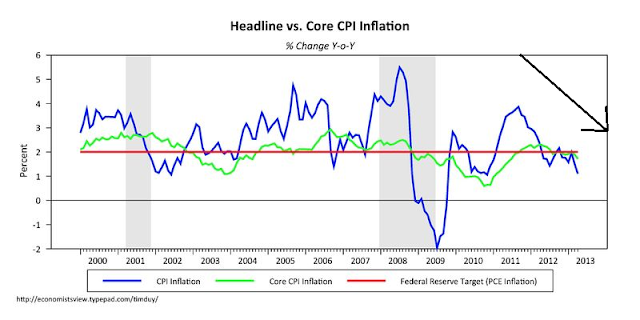 Inflation is running a little hot, but not at a fatal level. And the unemployment rate is very low. Resistance was strong in the 60-65 price area -- the pre-recession highs. However, prices have recently moved through that level. 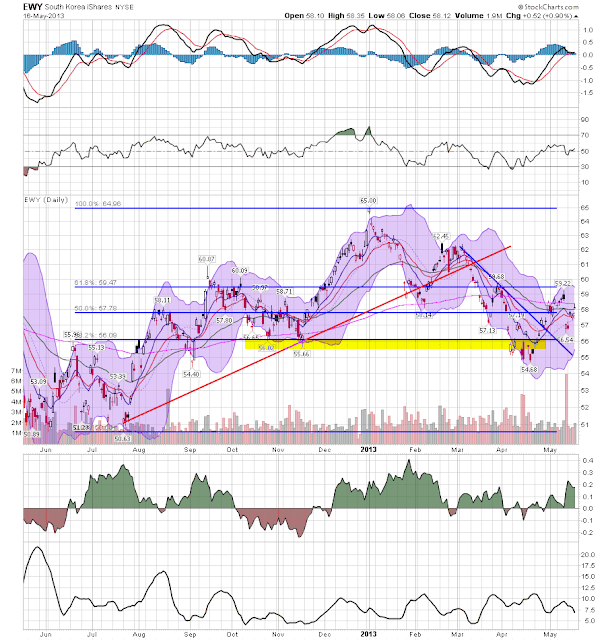 Essentially, we see a rally from mid-June2012 to the Spring of 2013. Since the beginning of the year, prices have been meandering sideways, trading between the 70 and 76 level. Overall momentum has been weak, with the MACD nearing a "0" reading. The CMF tells us there's a net selling situation, albeit at small levels. 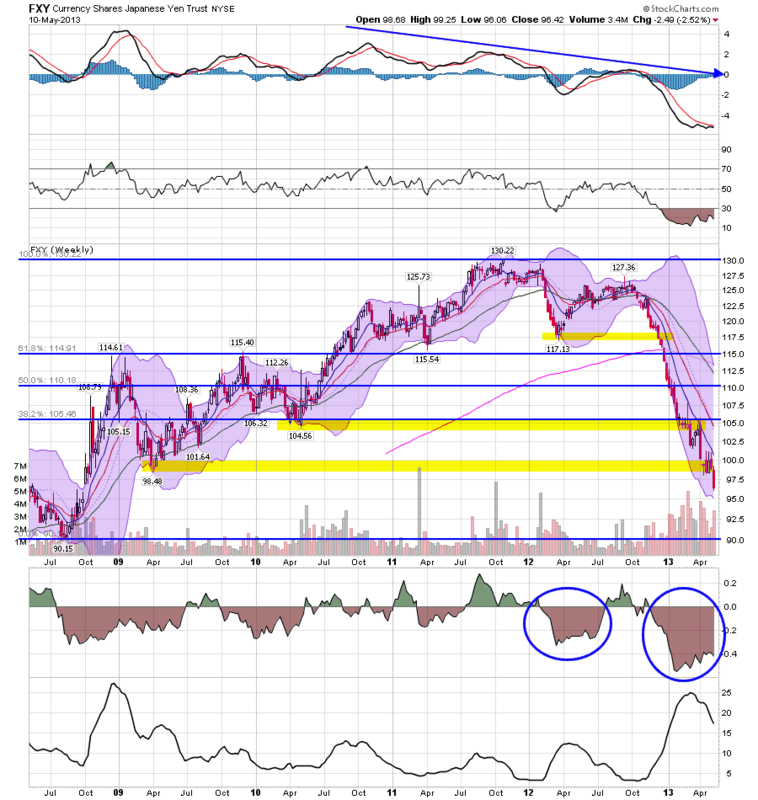 All three of the shorter EMAs are trading in a very tight range, again giving us no sense of upcoming direction. 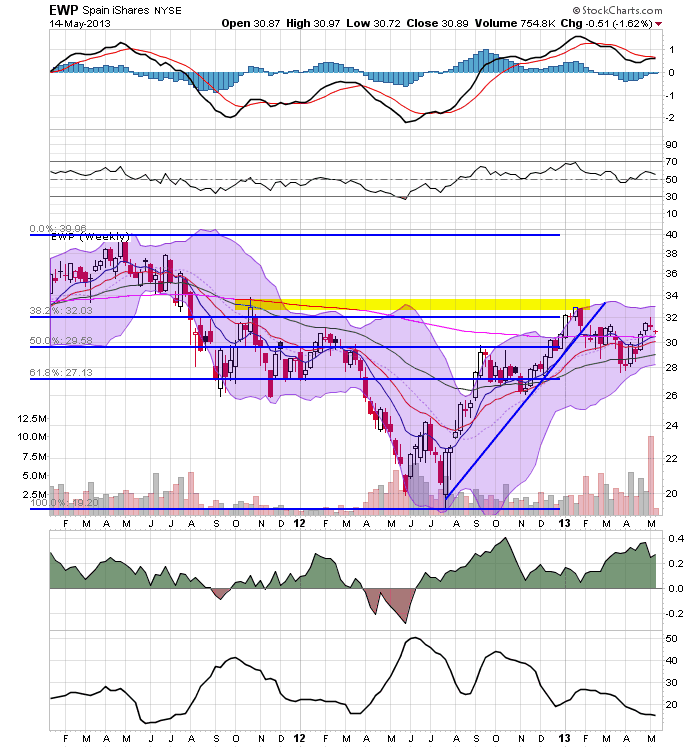 Overall, the daily chart is one of consolidation since the beginning of the year. As with any chart, pay particular attention to the price/200 day EMA relationship. Right now, it tells us we're still in a bull market. Wholesale prices in the U.S. dropped in April by the most in three years, reflecting a decrease in fuel costs that is helping underpin profits. The producer-price index declined 0.7 percent, the biggest decrease since February 2010, after falling 0.6 percent in March, according to a Labor Department report released today in Washington. The median estimate in a Bloomberg survey of 73 economists projected the index would decline 0.6 percent. So-called core wholesale inflation, which excludes often-volatile food and energy prices, climbed 0.1 percent. Slow growth in the U.S. and abroad is holding input-price gains in check for American factories. Absent a surge in inflation, policy makers at the Federal Reserve have the option of weighing whether the U.S. economic expansion needs more stimulus to pick up. Guess What? The EU Is Still A Basket Case! 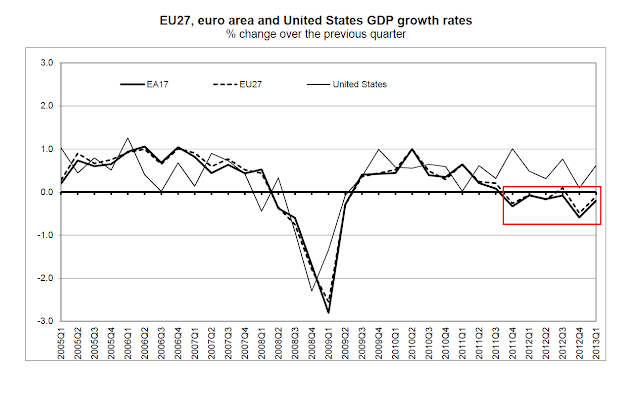 GDP fell by 0.2% in the euro area1 (EA17) and by 0.1% in the EU271 during the first quarter of 2013, compared with the previous quarter, according to flash estimates2 published by Eurostat, the statistical office of the European Union. 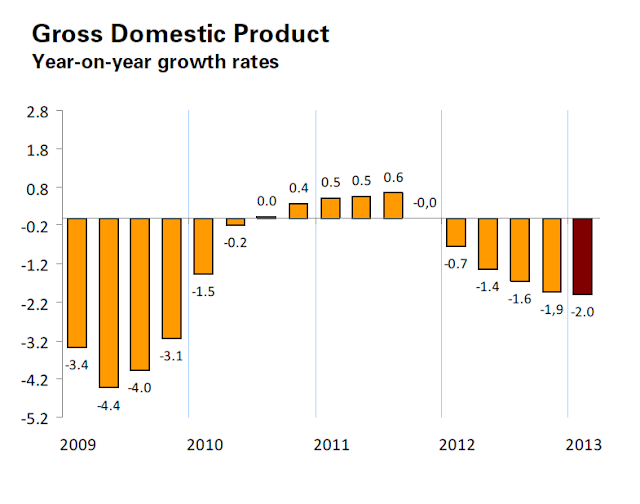 In the fourth quarter of 2012, growth rates were -0.6% and -0.5% respectively. Compared with the same quarter of the previous year, seasonally adjusted GDP fell by 1.0% in the euro area and by 0.7% in the EU27 in the first quarter of 2013, after -0.9% and -0.6% respectively in the previous quarter. As the above chart shows, the breadth of the slowdown is wide: 8 countries have seen four straight quarters of year over year contraction. 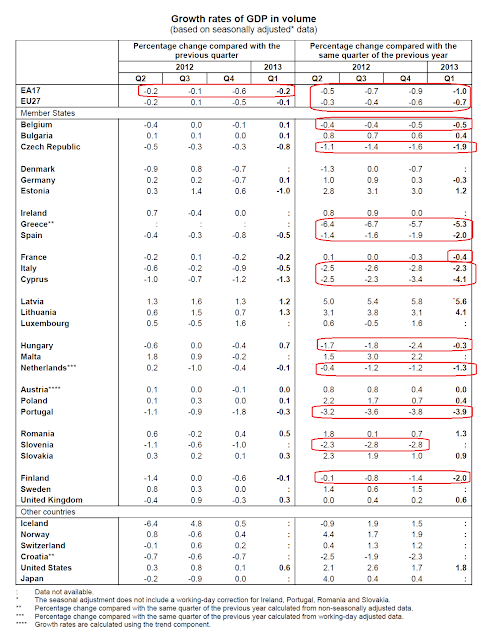 France and Germany have printed a negative Y/O/Y number in the latest quarters. 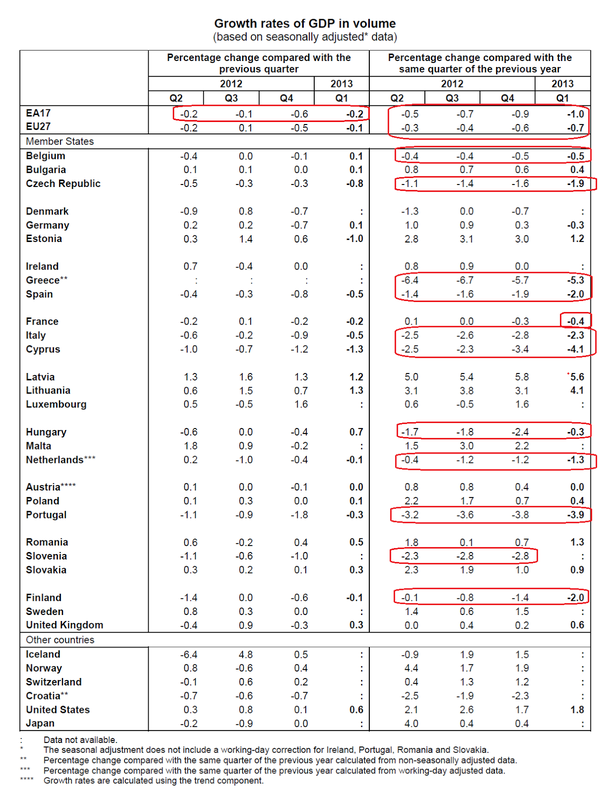 Only three countries (the Baltic state of Latvia, Lithuania and Estonia) are showing any rate of meaningful Y/O/Y/ growth and they are still far below potential GDP rates with high unemployment. This is the net end result of austerity. 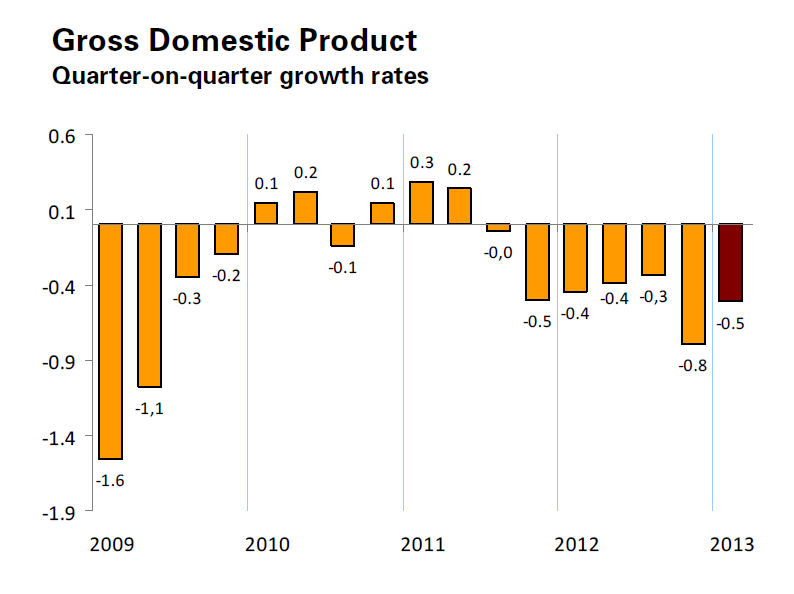 The economy has been experiencing negative quarter on quarter growth rates for 8 quarters or two years. 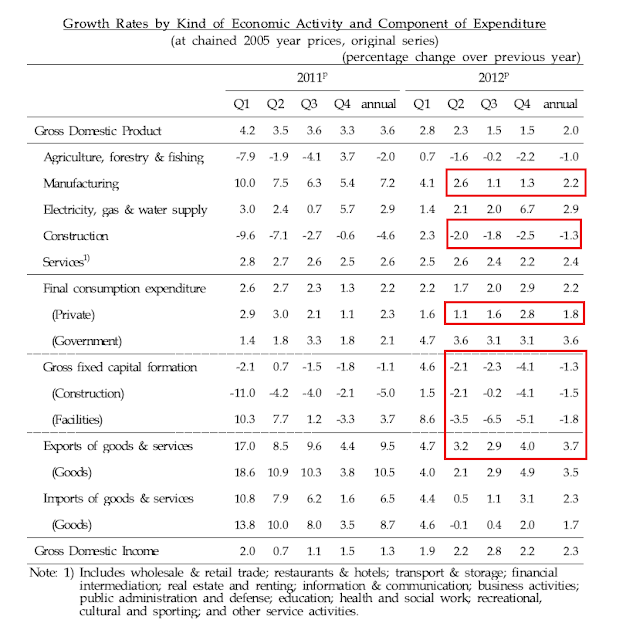 Just as importantly, consider the year on year growth rates in the second chart that show a contraction for five quarters. Let's look a little deeper into the GDP numbers. With the exception, we see a decrease in the annual percentage changes of all major GDP components. 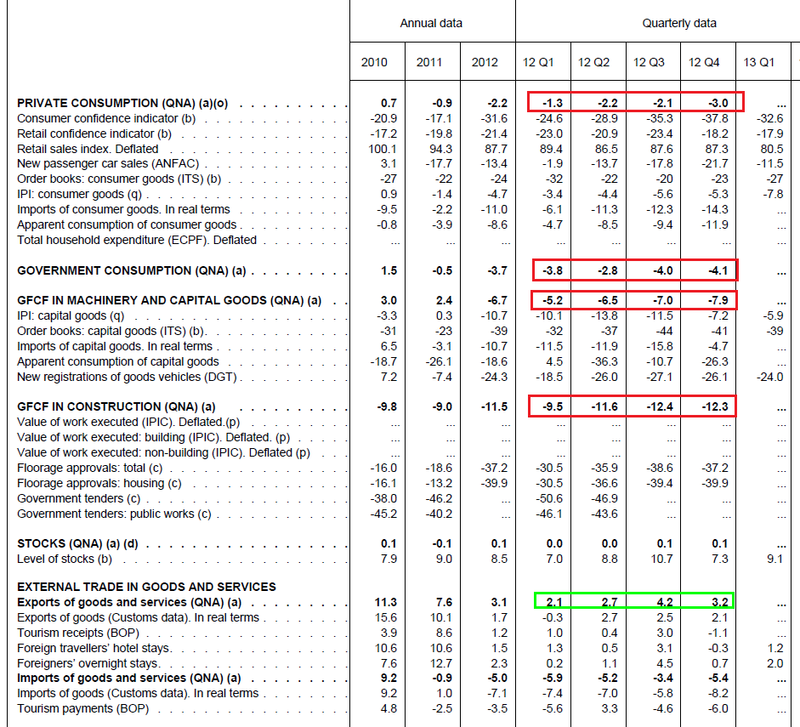 And these are not small changes: machinery investment is dropping on average at a 6.65% rate, construction is dropping at an 11.45% rate, and overall PCEs are dropping 2.15% rate on average. The only good news is coming from exports which are increasing. 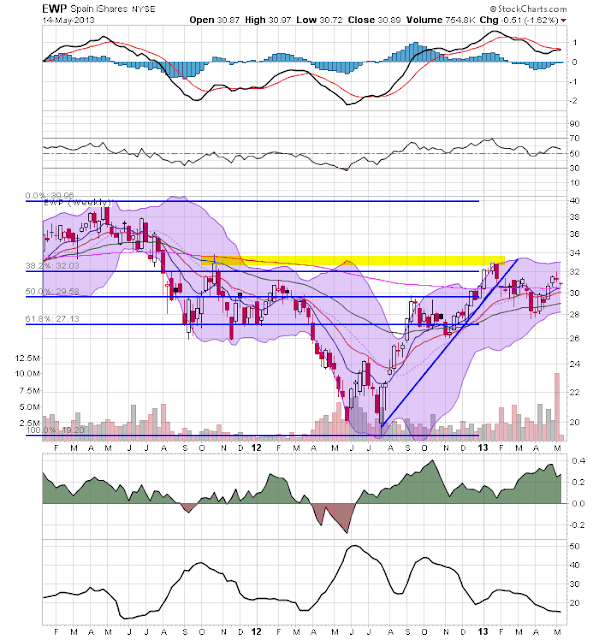 Let's place this information into a market context by looking at the Spanish ETF, EWP. Notice three basic price trends. First we see a decline from April 2011 to July 2012. Prices consolidated about half way down between the 26 and 32 price level. Starting at the end of last summer, the ETF rallied as the ECB stated it would do "whatever it takes" to keep the euro together. However, we see that rally end in the spring of 2013 as negative news about the EU region started to increase. On the daily chart, we see the trend break right at the end of January. 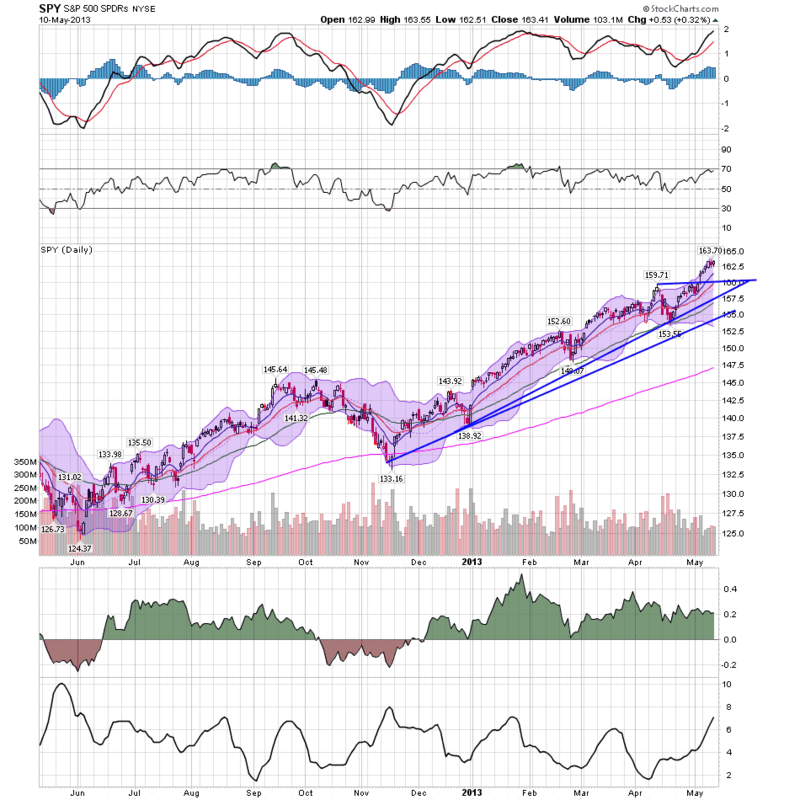 However, the sell-off was quite disciplined; notice that prices moved lower in a downward sloping trend channel, to right below the 200 day EMA and the 61.8% Fib level from the late summer-early spring rally. Prices are now meandering with little sense of direction. It is worth remembering an important fact here: The IRS is supposed to reject groups that are primarily political from registering as 501(c)4s. If they’re going to do that, then they need some kind of test that helps them flag problematic applicants. And that test will have to be a bit impressionistic. It will mean taking the political rhetoric of the moment and watching for it in applications. It will require digging into the finances and activities of groups on the left and the right that seem to be political even as they’re promising their activities are primarily non-political. If we’re not comfortable with that, then we need to either loosen the definition of 501(c)4s or create a new designation that gives explicitly political groups the benefits of the 501(c)4s (namely, they don’t have to pay taxes and they can keep their donors anonymous). But either way, as I wrote on Friday, the only way to make sure this doesn’t keep happening is for the IRS — or the Congress and White House that control it — to make some tough decisions about 501(c)4s. The context for all this is that after Citizens United and some related decisions, the number of groups registering as 501(c)4s doubled. Because the timing of that doubling coincided with a rise in political activism on the right rather than the left, a lot of the politicized groups attempting to register as 501(c)4s were describing their purpose in tea party terms. A popular conceit, for instance, was that they existed to educate on the Constitution — even if the particular pedagogical method meant participating in Republican Party primaries and pressuring incumbent politicians. Unfortunately, the service really screwed up on this one. They should have been far more sensitive to the political implications of what they were doing and come up with a way to screen applicants that was not based on clearly right leaning groups. Frankly, I think think the proper action would be for all groups trying to use this section of the code to be given stringent applications that attempted to separate the political from the non-political. But in the last few months, the nation’s new prime minister, Shinzo Abe, has pushed policy makers and other officials to take bold steps to revive Japan, one of the world’s largest economies. Their handiwork was evident Friday when the yen hit 100 to the dollar for the first time in four years. Normally a weakening exchange rate might be taken as a sign of decline. The yen has fallen nearly 14 percent against the dollar this year, and no currency has fallen more except the Venezuelan bolívar. In Japan’s case, it is a sign that the policies put in place by Mr. Abe and Haruhiko Kuroda, chairman of the Bank of Japan, are starting to work. A weaker yen makes Japanese exports more competitive around the world. Since the beginning of October to now, the yen's ETF has dropped from 126 to ~96, which is a percentage decline of nearly 24%. 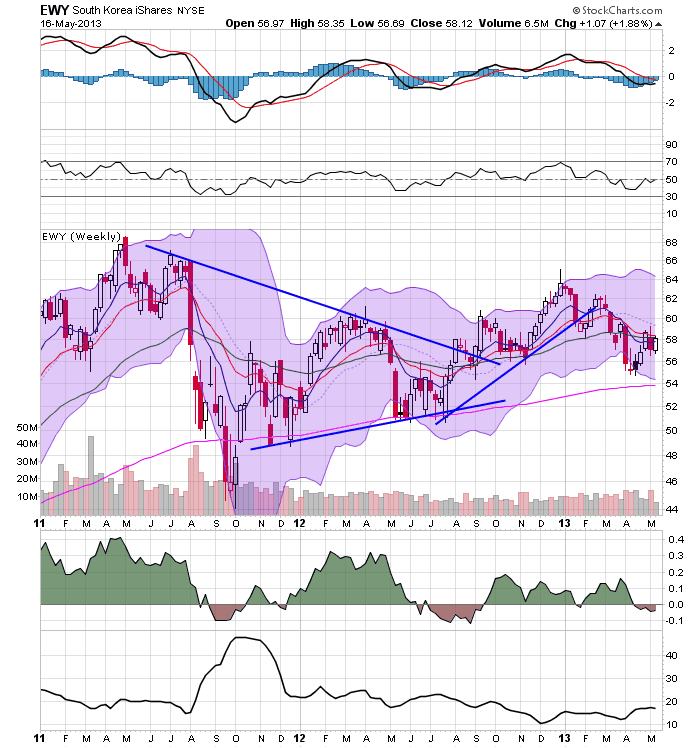 The chart itself is incredibly bearish -- prices are making lower lows and lower highs, all the EMA are moving lower, momentum is in negative territory and the money is flowing out of the market. From late 2008 to late 2011, the yen rallied from 90 to 130 -- an increase of 44%. This overall policy has a long way to go, but it's having the intended initial effects. On the surface, yesterday's report on retail sales for April was just barely positive, rising 0.1% after a revised -0.5% decline in March. But the real story is how strong inflation adjusted retail sales are likely to be. In fact, they probably set a new post-recession high. You can thank the loosening of the Oil choke collar for that. While nominal rales have declined -0.4% since February, once we subtract gasoline sales, nominal sales have actually increased +0.6%. But it gets better once we factor in inflation. March featured -0.2% deflation, and if my analysis is right, on Thursday we are going to find that consumer prices declined -0.4% or -0.5% in April. That means that real retail sales for April are likely to have risen +0.5% or +0.6% over March, and further that real retail sales are up +0.3% over February to a new post-recession high. The resilience of the consumer in the face of the 2% increase in the payroll tax, as evidenced weekly by same store sales and Gallup's consumer spending poll, and now confirmed by the Census Bureau's monthly retail sales report, has to be one of the big surprises of the first half of 2013. 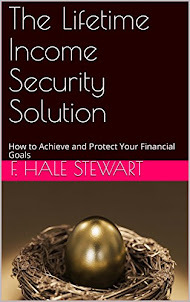 The dark cloud within this silver lining is the strong decline in the personal savings rate. At the same time, it certainly bespeaks a real robustness in consumer confidence - at least as reflected in how consumers vote with their wallets. With interest rates at multi-decade lows, the US could borrow at incredibly low rates, hire the out of work blue collar people (primarily manufacturing and construction workers) and fix our crumbling infrastructure. Problem solved. The long-term growth projections from such a move would more then pay for the original cash outlay. I especially like the idea of classifying unemployment as a pandemic. That makes perfect sense. Anyway, read the whole piece. It's well worth your time. The odds of disinflation are mounting as the world economy slows anew and commodity prices slide, defying forecasts that easy money would trigger an acceleration of prices. More than half of the world economy, including the U.S. and the euro area, instead confronts inflation below the central banks’ desired levels, according to Ethan Harris, co-head of global economics research at Bank of America Corp. in New York. Declining prices for everything from gasoline to coffee are good news for consumers. 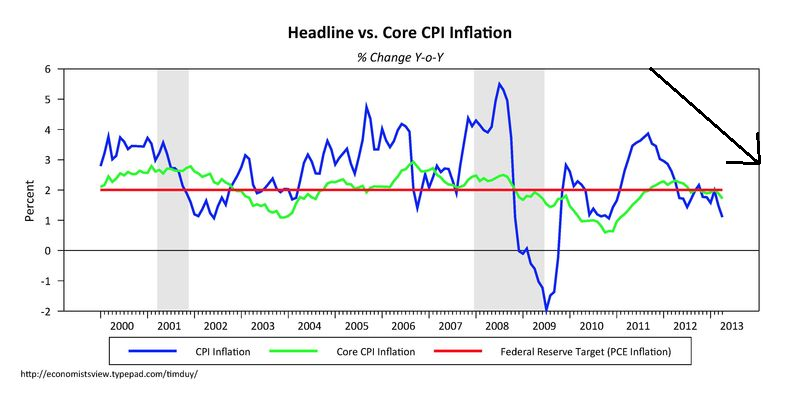 The danger comes when disinflation turns into deflation, which leads households to hold off purchases in anticipation of even lower prices, and companies to postpone investment and hiring as demand for their products dries up and profits drop. Oil has been trading between 85 and 100 for a little under a year. Both grains (top chart; wheat, corn and soy beans) and softs (bottom chart; coffee, cotton and sugar) are in the middle of a year long decline. 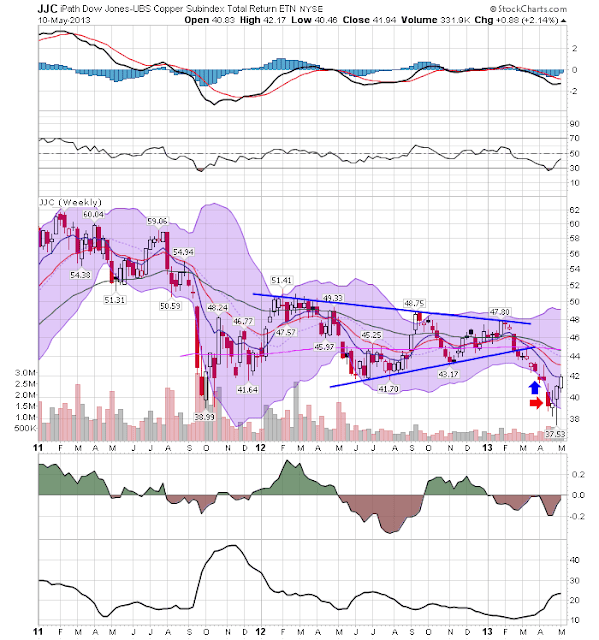 Copper is also trading just above multi-lows. And finally, gold (which I use as a proxy for inflation sentiment) has broken through support and is trading at the 200 week EMA. This is translating into weak price pressures across the globe. The EU is experiencing declining prices. The rate of year over year percentage change is declining for the last three months. 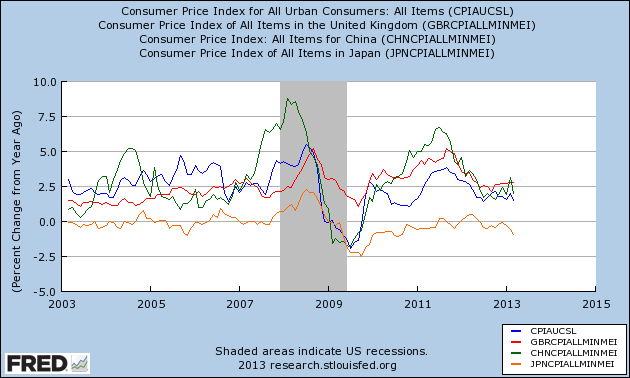 And above is a chart of the year over year percentage change in CPI for the UK, US, Japan and China. Notice that prices are very much contained. Anyone talking about inflationary threats or hyperinflation isn't paying attention right now. 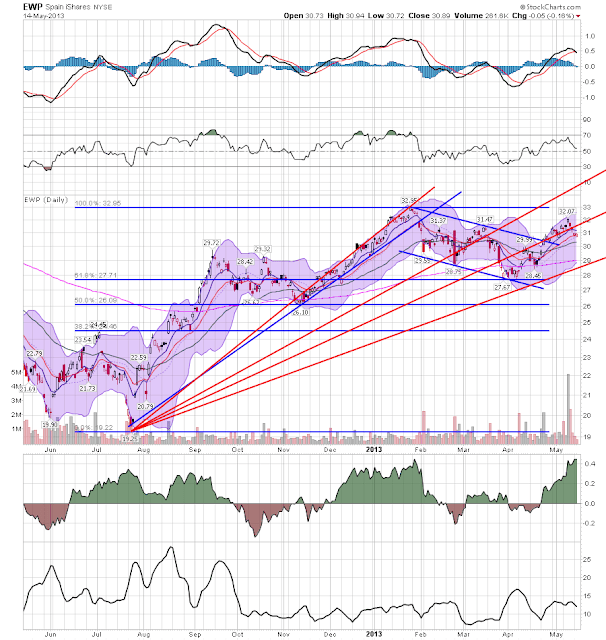 Pulling back to a year long view of the daily chart, first notice the rally that started in mid-Novemver. We see a continuing upward move of higher highs and higher lows with prices using the EMAs for technical support. There are also several periods of price consolidation (late February, late March, mid and late April/early May), allowing the market to "breath." The CMF indicates we've seen a steady stream of money flowing into the market. The one negative of the chart is the MACD declining for a fair amount of the period in a modest way. The NASDAQ has been a surprising laggard to the current rally. While this index also shows an uptrend starting in mid-November, it was contained by yearly highs established in mid-September. However, prices have finally broken through the 70 price level, making strong advances, closing the week at 73.10. 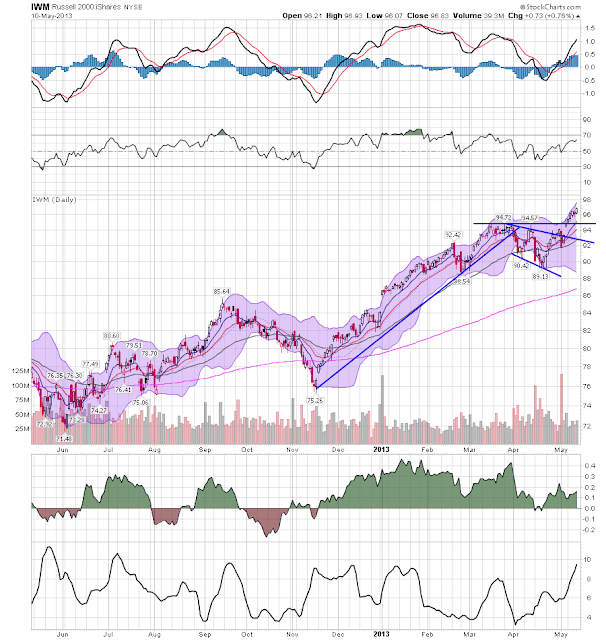 Again we see a consistent inflow of money and -- unlike the SPY -- a strong MACD reading. 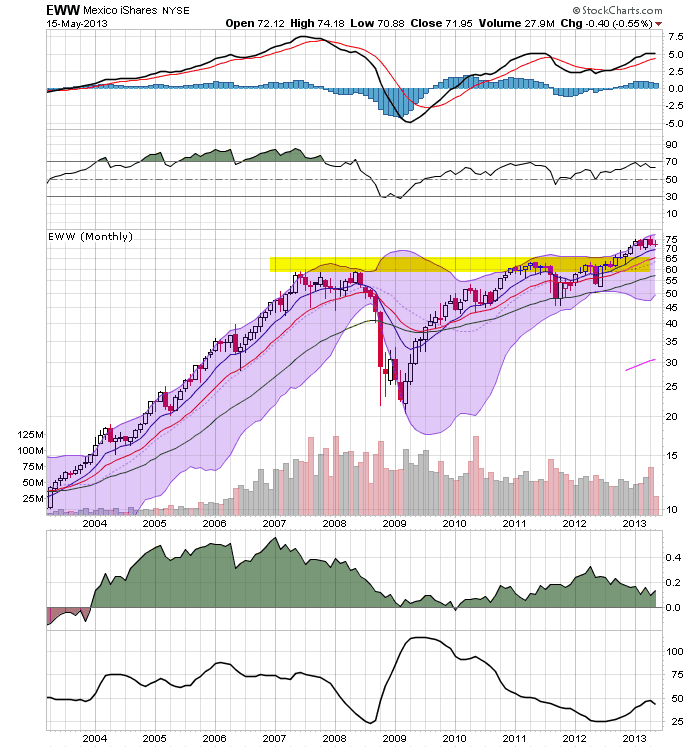 The Russell 2000 shows three primary trends. 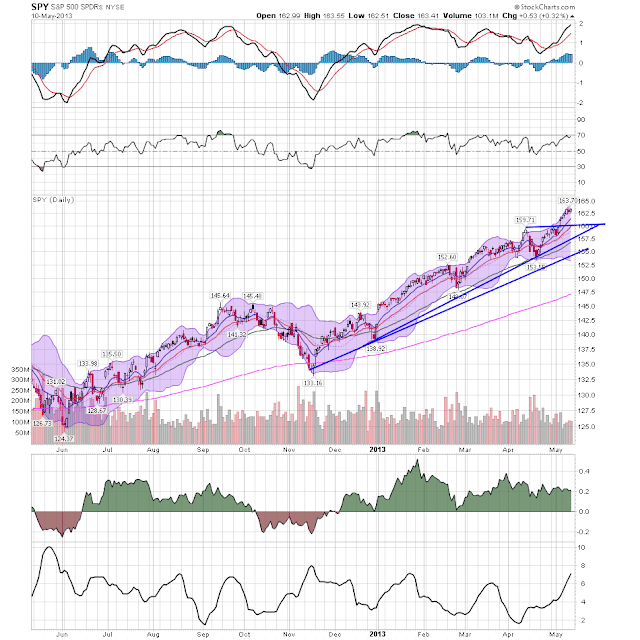 A rally from mid-November to late March, a downward sloping trend channel from late March to late April and then a rally breaking through the top line of the channel and the high established in late March. 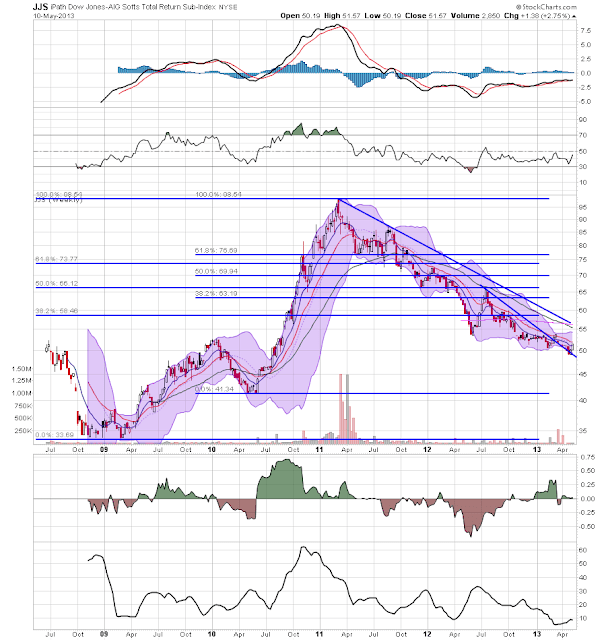 The MACD is now printing a strong level of upward momentum and the CMF is showing decent cash inflow into the market.